In Night in the North, His Majesty's Royal Mail, the man and his dog team travel towards the distant horizon under a night sky so clear that the Milky Way can be seen. Franz Johnston journeyed frequently to the Canadian North, from the early days of the Group of Seven up until his last trip to the Nipigon territory in 1946, ranging from northern Ontario to Eldorado at Great Bear Lake. Roger Burford Mason writes that on these northern trips, Johnston “reveled in the brilliance of the light, the intense clarity and colour generated in those rarefied atmospheric conditions.” This night scene also shows Johnston's mastery of the medium of tempera, one which was predominant in his oeuvre. With its icy blues, crackling sub-zero atmosphere and transcendent starry sky, Night in the North, His Majesty's Royal Mail is an outstanding northern work by Johnston. 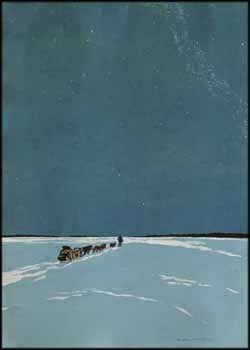 The National Gallery of Canada has a 1917 tempera painting of a similar subject entitled A Northern Night in its collection, depicting two men crossing a snowy plain with a backdrop of a night sky full of stars and northern lights.